A couple of weeks ago, I posted about taking food inspiration from dining out. 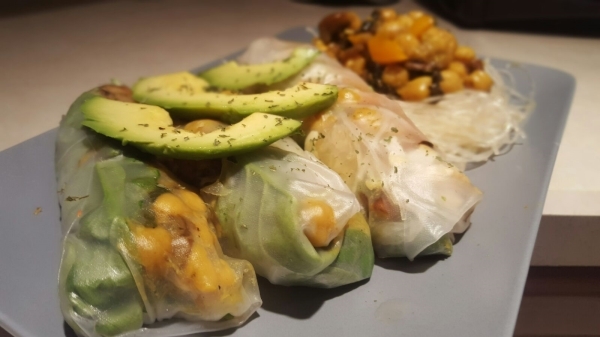 I've been continuing with that theme in the Matthews kitchen and the focus this week was on learning to make summer rolls. I love to eat them but I'd never thought about learning the steps for making them at home. I will say that my rolling skills need some work but the meal was yummy. In terms of fillings, I went with what I had at home. That included chickpeas (I know it's not traditional), portobello mushrooms, spinach, avocado and orange bell peppers. I had rice paper wrappers and cellophane noodles sitting in the pantry, which I purchased a few weeks ago in anticipation of this project. In terms of protein, Ash wanted grilled fish in his. I stuck with the veggie mixture. I did a lot of research on technique and recipes before I started cooking. My favorite recipes are here 1/2/3. My favorite technique videos are here: 1/2. 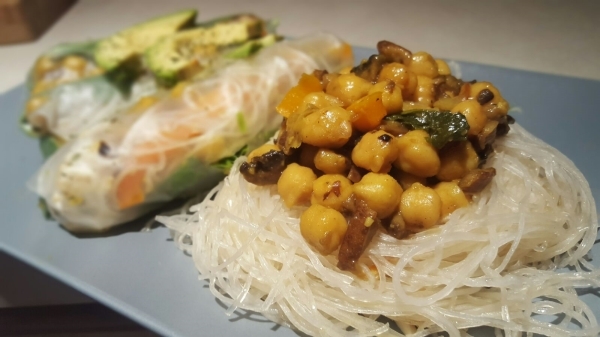 Ultimately, I didn't use all of the cellophane noodles in the rolls so i tossed them in an orange ginger sauce and topped them with the rest of the bean mixture.